Joseph S. Nye Jr. (from left), Juliette Kayyem, and R. Nicholas Burns offer their perspectives on the death of Osama bin Laden and what it means for U.S. foreign policy and the future of Islamic nations. Harvard foreign policy experts say the death of Osama bin Laden is a blow to al-Qaeda, and a sign of the vitality and persistence of U.S. anti-terror expertise. But it will also renew the debate over U.S.-Pakistan ties and may even set the stage for a season of reprisals against American interests. Still, the good news takes the lead. Bin Laden’s death is a “significant blow” to al-Qaeda, he said. But it does not mark the end of the global war on terrorism, since sympathizers “will now seek revenge against the United States,” said Burns. Bin Laden had slipped into a more symbolic than operational role, “but the forces he unleashed still exist,” said Juliette Kayyem, assistant secretary for intergovernmental affairs in the Department of Homeland Security from 2009 to 2011. “My biggest fear is not another 9/11,” she said, but low-level attacks that are not dramatic but are harder to detect. Meanwhile, “we have a lot of accounting to do with Pakistan,” said Kayyem, one of many commentators wondering about the implications of finding bin Laden comfortably housed in a Pakistani garrison town. 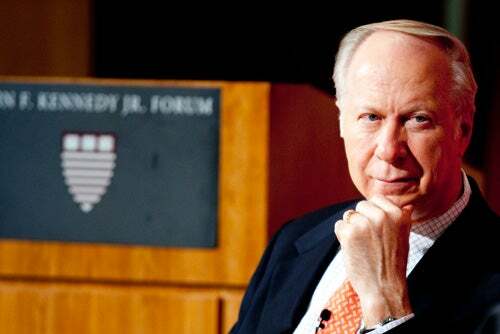 Perhaps the greatest victory goes to the White House, said David Gergen, an adviser to four presidents and director of the Center for Public Leadership at HKS. Yes, his death has symbolic impact, but bin Laden no longer had an operational role in al-Qaeda, he wrote. And bin Laden had become the titular head of a violent, fundamentalist movement that ultimately failed, swept aside by a wave of youthful sentiment in the Middle East inspired by “more universal ideals of democracy,” said Walt. The same military and intelligence prowess used to find and kill bin Laden will now be focused on other senior leaders among terrorists, said Kayyem. Read updates from Harvard Kennedy School. In a talk at the Harvard Graduate School of Education, New Jersey Gov. Chris Christie urged students to “take chances, take a little risk,” to help improve the nation’s public school systems. “In my view, this is the biggest fight we can have,” he told the crowd.